Description: Hand signed, numbered in pencil. Complete suite of 7 etchings with aquatint (some with color added). From the edition of 150 on Arches. Authenticated on verso by Frank Hunter. 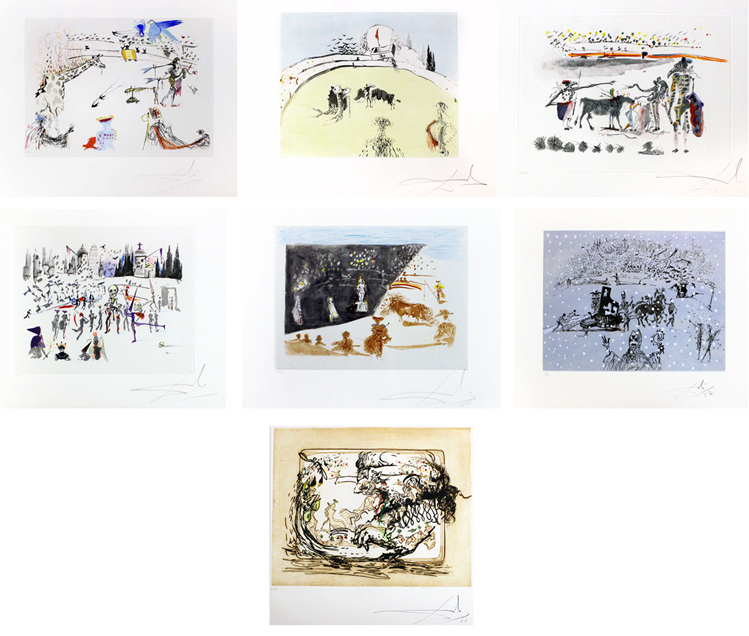 La girafe en feu (The Girafe on Fire), Tauramachie au tiroir (Bullfight with Drawer), Les perroquets (The Parrots), La télévision , La statue, Le piano sous la neige (The Piano in the Snow) , Les moulins (The Mills). Each sheet size: 19.67 x 23.62 inches. Each image size: 12.52 x 16.22 inches. Artwork is in excellent condition. Certificate of Authenticity included.